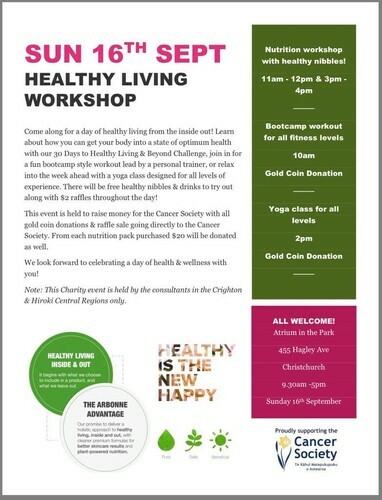 Come along for a day of healthy living from the inside out! Learn about how you can get your body into a state of optimum health with our 30 Days to Healthy Living & Beyond Challenge, join in for a fun bootcamp style workout led by a personal trainer, or relax into the week ahead with a yoga class designed for all levels of experience. There will be free healthy nibbles & drinks to try out along with $2 raffles throughout the day! This event is held to raise money for the Cancer Society with all gold coin donations & raffle sales going directly to the Cancer Society. From each nutrition pack purchased $20 will be donated as well. We look forward to celebrating a day of health & wellness with you! Bootcamp for all fitness levels 10am (gold coin). Yoga class for all levels 2pm (gold coin). *Mention this event from eventfinda to receive a freebie from Jess.